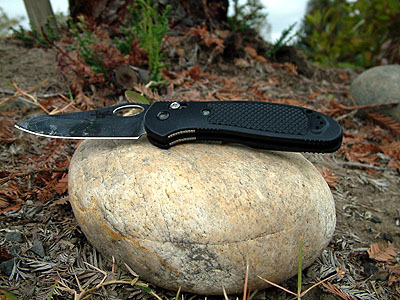 The Griptillian Folding Knife from Benchmade: Quality meets functionality! Introduction: A quality knife is a tool that no angler or outdoorsman can afford to be without. Go into just about any outdoors equipment retailer and ask them for their highest quality knifes and you will most likely be recommended to check out some of the latest Benchmade offerings. TackleTour did just that and purchased the Benchmade Griptillian 550 see if this manufacturers shining reputation holds true! Closed / Folded Size 4.62"
Impressions: Zander would agree that sometimes less, is more. I too appreciate and value tools that are made for specific applications. Utility knifes that include everything but the kitchen sink, while very cool, sacrifice individual pure performance. Plus, these type of utility knifes are generally un-safe as they do not lock. Like a knight to his sword, it's very important that you have a knife that you can trust and rely on in any circumstance! 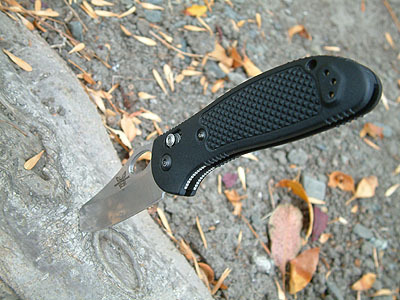 The Benchmade Griptillian 550 IS that level of knife. The field tests: The Griptillian has been my primary knife since June this year. The guys here at TackleTour would probably agree that the equipment that I own gets pretty abused. The knife is no exception! I put this knife not only through standard outdoors excursions, but also though every-day use where some of the most important tests reside. 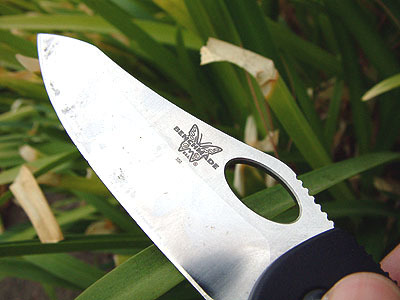 The Blade: This blade was designed by one of Benchmade's premier and most experienced designers, Mel Pardue. He introduced a new blade design for the Griptillian 550; what Benchmade calls a "genetically" modified sheepsfoot blade. It's forged from 440C stainless steel and has a hardness rating of 58-60. The drop-point of the blade is formed perfectly. There are no flaws or unevenness that you may see with lesser quality blades. Not only is the stainless steel extremely sharp across the blade surface but the tip is sharp enough to pierce rawhide leather and puncture 500 denier cordura with ease. At 3.4" in length it's no sissy and at the same time it's still able to be classified in the 'everyday carry' range. It is extremely sharp, and yes, can do very well what all of us like to do with a new knife when we first test it...slice up some paper! So how did it do you ask? Let's just say that your local butcher would be proud! The blade we tested sported a satin finish and in the sun it was a bit reflective. 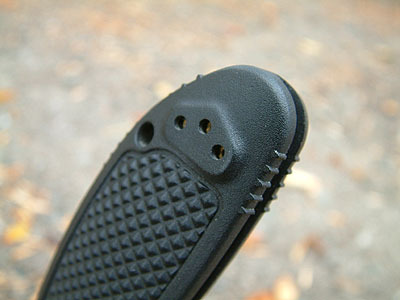 To avoid glare, anglers can opt for the same knife with a black teflon coated blade. Another option anglers can choose is the standard "plain edge" blade we tested or the "combo edge" which has a serrated edge near the base of the blade. Folding and Locking: Definitely my favorite part of this knife is it's performance when folding and un-folding! "It's like butter" I can count about 6 different ways to open the Griptillian. I've seen some debate in the Benchmade forums about the speed of the AXIS lock, which is incorporated in this knife. For those who care about the speed, after it's broken in, it's plenty fast depending on the method in which you choose to you open it. My preferred way to open the knife is a combination of thumb and wrist action in which I torque my wrist while extending the blade with the thumb hole on the blade. This quick movement extends the blade in less then a second, and emits a satisfying "snap," as the AXIS lock safely holds the blade in position. The AXIS lock is not only very unique but it is also very reliable. 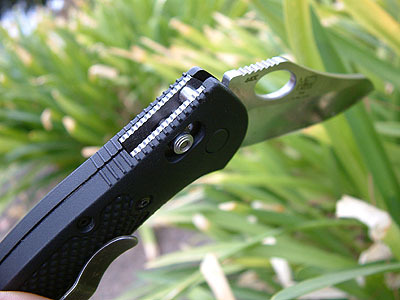 AXIS lock is shaped so that it that will grip to your finger when you are using it and close the blade unintentionally. The Strength: The materials and construction of the Griptillian are superb. The blade is secured neatly into the AXIS lock by a flushed steel pin. It and the other screws can be adjusted if needed by using a star-headed tool. There is neither any flex in the knife laterally or in the blade in any direction at all when locked. While not the hardest steel available, the strength of the steel is well suited enough for most outdoor activities. Over the time that I have had it so far, I've used it on wood, cardboard, plastics, insulated cable and of course, fishing line. While any blade can cut through mono this Benchmade also makes short work of the toughest braided and medium class steel leaders. After all tests there was no damage to the handle or the blade surface. The Feel: The grip of the Griptillian is obviously one of the most important features given that it's the grip that allows you to utilize the razor sharp blade safely. Not to mention that it seems that it's namesake "GRIPtillian" would imply something special about the grip. There are ribs along the length of the knife and even up onto the base of the blade itself. In addition, there are porous, bubble type indentions on both faces of the handle. Even the clip is also designed so that it forms to your finger when gripped. The only downside to the oversized grip is the weight it adds to the knife, at 3.25 oz. 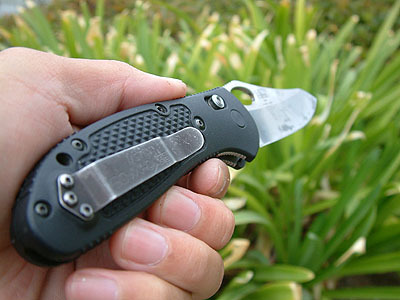 the Griptillian is not considered light for its size, but still reasonable for most applications. Underwater tests also yielded very good results with no loss of grip underwater even when opening thanks to the oval shaped thumb hole in the blade. When fishing anglers hands are often wet and covered with slime, the Griptillian's unique grip design makes it easy to maintain a good grip on this tool. J Beautiful and extremely sharp satin finished blade! L Blade material not the hardest available. J Excellent ergonomics and grip! L Slightly hard to clean inside the AXIS lock area. J Confident single handed operation! Conclusion: A lot of praise can be said about this quality product from Benchmade. Not only does Benchmade manufacture some of the best quality knifes in the world, but many editions are also collectable. The ideal anglers that need to have the Griptillian are fly-fisherman, because of this knife's excellent one-handed operation and grip even when wet. It can be opened and closed with ease and confidence with second nature type reflexes thanks to the overall grip design and the AXIS lock. Even in underwater and other wet conditions, this knife performed wonderfully! Highly recommended as your primary outdoor blade or everyday carry, the Griptillian comes with enough options to customize the blade and handle configuration, so that anglers will feel confident grasping this knife. Until next time... "Fish On!"